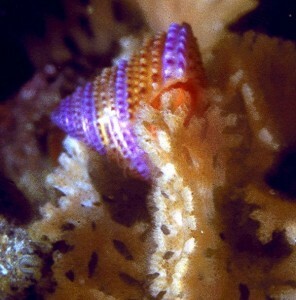 A small temperate trochid, Calliostoma annulatum. This gorgeous snail is a grazing carnivore and its food consists of bryozoans (shown here), and hydroids. Not all beautiful marine animals are found in the tropics. Image copyright Ronald L. Shimek, Ph. D.. There are a lot of different types of invertebrate creatures. If a “species” is considered to be a distinct type of organism, and without getting into a semantic argument about just what a “species” actually is, for most of the last century it was assumed that there were about one million animal species. Roughly five percent of this total were considered to be vertebrates, most of which were fishes. The vast majority of animal species, perhaps about eighty percent, were insects; of these, the vast majority were beetles. Everybody knows that the insects are invertebrates, but they are generally not treated in invertebrate zoology classes for three reasons. First, the insects are all very similar in basic body structures. Second, only a few species are found in the oceans. Third, because of their profound economical importantance, the study of insects comprises its own scientific sub-discipline, entomology. 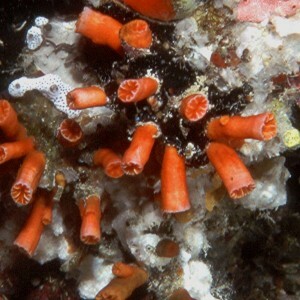 The remaining, more-or-less fifteen percent of the so-called “Animal Kingdom” contained “The Invertebrates”; a group patently and improperly defined by the lack of a backbone in all of its members. Recent investigations, using some of the modern techniques derived in the last couple of decades, have allowed a better estimate of the total number of animal species. We now know that a total of one million species is a vast understatement; depending upon who is on the soapbox and what their point is, estimates of the total number of animal species range upward to well over 100,000,000. Many of these are insects, but many others are not; other large groups are the nematodes (roundworms), mollusks, and trematodes (flukes). Truly, the structural diversity of animal life is found in those animals that are neither insects nor vertebrates. These, the non-insect invertebrates, are the animals generally now considered to be lumped together as the “invertebrates“. My own interest in invertebrates was sparked and continues to be fueled by the tremendous number of different structural plans for animals. All animals must do a few things: 1) they must move, 2) they must obtain nutrition, 3) they must eliminate waste, 4) they must sense their environment, 5) they must avoid being eaten, and 6) they must reproduce. The number of different ways that natural selection has molded animals to be successful at these tasks is truly phenomenal, and it is where my interests lie. And that is what I will, in general, discuss in my posts here. Which of the two images below was photographed on a coral reef? 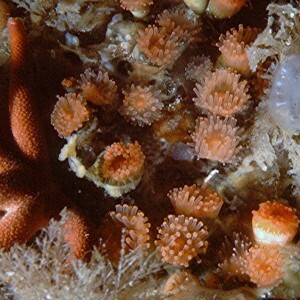 Non-hermatypic cup corals, on a subtidal cliff at a depth of about 30 m (100 ft). Image Copyright: Ronald L. Shimek, Ph. D.
As a result, in my blog entries I will discuss invertebrates, at least most of the time. Some of those discussions will concern coral reef animals and those posts may be directly relevant to the reef aquarium hobby and hobbyists, but probably the majority of my posts will be delve into other aspects of the biology of invertebrate animals. Coral reefs are geological structures, built by remarkably poorly known, but exceedingly diverse aggregations of organisms. In a manner analogous to learning about a rainforest by studying all trees in general, I hope that readers of this blog will help readers understand a bit more about the animals in their care, and to this end I will use whatever organisms I can to illustrate my point. For example, when discussing aspects of the functional morphology of corals, it is largely immaterial which individuals of the two coral species illustrated in the two photographs above are chosen to illustrate my points. The top image above was taken in a subtidal cave on an island in the Palauan archipelago. The lower image was from a cliff wall on an island in Barkley Sound, on the southwest of Vancouver Island, British Columbia, Canada. Simply by looking at those images, it would be largely impossible to tell where the images were taken. I hope my posts here will be interesting enough to tweak the readers’ fancies about these wonderful animals and their place in the world of which we know remarkably little. Always like the Ronald postings. And the Aquarium Articles By Email, too. Great Blog!!! Also love your Pocket Expert guide book (Marine Invertebrates), definitely a great compact reference book I find myself referring to often. Thanks! !